I’ve long maintained that paywalls are a terrible idea and do nothing but drive potential readers elsewhere. The ROI of putting your content behind a paywall is far less than charging appropriate advertising rates on your site, or other inventive ideas. Don’t believe me? Ask yourself why newspapers and magazines have sold ads since time began. It’s not because they’re looking for filler. The subscription price has never been sustainable for a magazine or newspaper. Why would that change simply because we’ve moved to a digital model? Take a moment and think about who is clamoring for paywalls. Wall Street Journal. New York Times. Essentially, NEWSPAPERS AND MAGAZINES. I bet if you ask Pete Cashmore about putting Mashable content behind a paywall he’ll laugh you out of the building. In the new economy, I believe personal information that a company can use to market to a person is far more valuable than the $50 a year you can squeeze out of them for a subscription. A small tidbit about a person may be able to sell them hundreds, maybe even thousands, of dollars worth of product rather than getting $50. Google’s “Consumer Survey” is a creative way to both be paid for each visit and to collect valuable information to sell to readership. 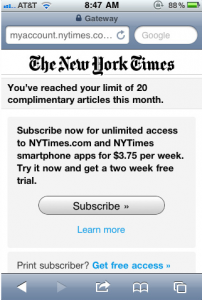 This is the beginning of the end for paywalls. P.S. For a really fun laugh as to why paywalls are ridiculous, visit that flickr stream and look at the first comment.